Light is aform of energy which controls the sense of vision. 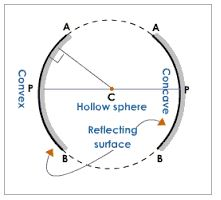 Concave mirror is a spherical mirror whose reflecting surface is curved inwards. A Good example is the driving mirror of a car. Convex mirror is a spherical mirror whose reflective surface is curved outwards. A good example of a convex mirror is a shaving mirror. Centre of curvature (C):the centre of the sphere of which a mirror is a part of. Radius of curvature (R): the radius of sphere of which a mirror is a part of. Pole (P): the central point of the reflecting surface of spherical mirror (curved or convex mirror). Principal axis:the straight line joining the centre of curvature (C) and the pole (P). Principal focus (F):the point o the principal axis where light rays tend to intersect. This point is between centre of curvature and the pole. 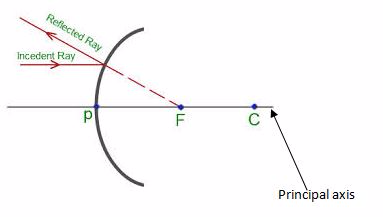 Principal focus (F):the point on the principal axis where light rays tend to intersect. This point is between centre of curvature and the pole. 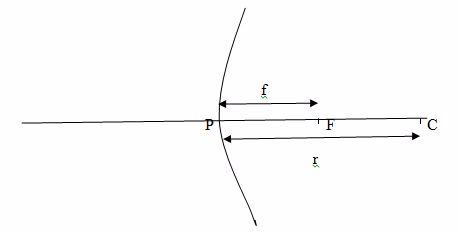 When a beam of light parallel and very close to the principal axis, CL, is reflected from a concave mirror, it converges to a point, F, on the principal axis called the principal focus. When a ray passes through the principal focus, F, it is reflected parallel to the principal axis. 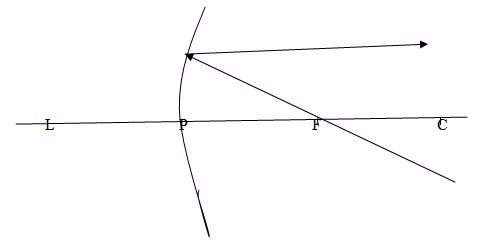 When a ray passes through the centre of curvature, C, which therefore strikes the mirror at normal incidence, it is reflected back along its original path. Note: Concave mirrors have a real focus because light passes through the focus. The formation of images by concave mirror tends to change as the position of object changes. Case 1: Image (I) formed by a concave mirror when the object is beyond C.
Case 5:The object is placed between F and P.
Obviously,there isonly one kind of image formed when an object is placed at any position. The image is formed behind the mirror. 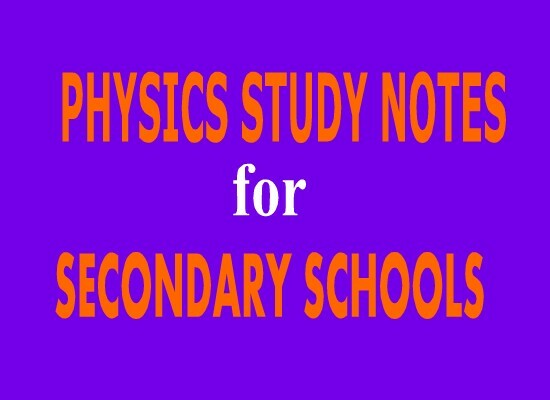 An object 2cm long is erected 8cm infront of a concave mirror of radius of curvature 10cm. By using a scale drawing, determine the position, size and nature of image formed. Focal length (f) is the distance between the principal focus and the pole. Why is convex mirror used as driving mirror? The convex mirror is used as driving mirror because it provides the wider field of view. Why concave mirror used as shaving mirror? Concave mirrors are used as shaving mirrors because they form an enlarged image when held close up. Refraction of light refers tothe bending of light as it passes through two different medium because the speed of light tends to change when travelling from one medium to another. Figure showing refraction of light as it passes from air to glass. The angle of incidence (i)is the angle between the incident ray of light and the normal at the point of incidence. The angle of Refraction (r)is the angle between the refracted ray and the normal at the point of incidence. 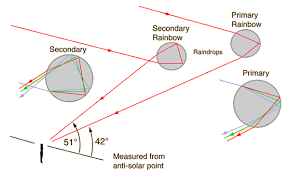 Second Law of refraction states that “when a light ray passes from one medium into another medium, the angle of incidence (i) and corresponding angle of refraction( r) are such that the ratio of sine of the angle of incidence to the sine of the angle of refraction (sini/sinr) is a constant value called the refractive index." 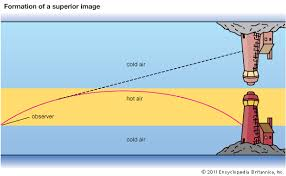 Note: The Second Law of Refraction is called Snell's Law in honour of a Dutch scientist named Snell (1591 – 1626) who first described it. Refractive index (n) is the ratio of the sine of the angle of incidence to the sine of the angle of refraction. Refractive index (n) is the ratio of the velocity of light in air to the velocity of light in glass. Refractive index, n is the constant number which expresses how many times or to what extent a light ray bends when passing through different medium. Absolute refractive index (na) is the refractive index between vacuum or air and any other medium. 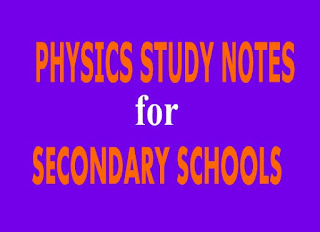 The refractive index for light passing from air to water is equal to 1.333 find the refractive index for light travelling from water to air. Apparent depth is the virtual height measured when viewed by observer. Critical angleis the angle of incidence (i) for which the angle of refraction (r) is equal to 90º . It is obtained when light rays moves from a dense medium to a less dense medium. This occurs when a light ray from a less dense medium is reflected into the denser medium at the boundary separating the two media. Light must be travelling from a more dense to less dense medium. Light must incident at the boundary at an angle greater than the critical angle (C). These are very thin tubes of plastic or glass and because they are so thin they can bend without breaking, so they can carry light around the corners. Used in telecommunications to carry telephone calls over vast distance, without loss of intensity and without interference. Used in endoscope to view inside a patient body for example inside stomach. Light is carried into the stomach through a bunch of fibres and is reflected into small camera, which then displays a picture on a screen. This is the phenomenon inwhich an object appears to be at an incorrect position due to the bending of light rays from the object. Mirages occur during hot days. 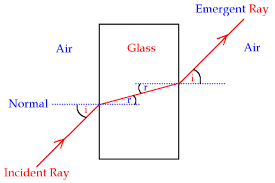 Deviation of light in a prism is the changing in direction of the incident ray when it enters/hits a triangular glass prism. In order to determine the minimum angle deviating (Qm) then we must set triangular Glass prism as follows. Dispersion of light is the splitting up of light beam (white light) into its seven components of colour by a prism. Spectrum is the patch or band of colours which comprise / constitute seven component of white light. Pure section is the patch or band of colours in which the colours are clearly separated. 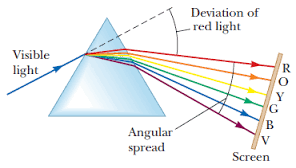 In order to produce pure spectrum then we must use two converging lenses (convex lenses). When colours of spectrum are combined, they form white light. 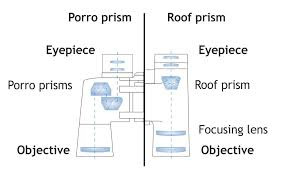 In order to combine colours of the spectrum, weneed two triangular glass prisms and one lens. Impure spectrum:the band/patch of colours which overlap and are not seen clearly. The rainbow:a bow-shaped spectrum of seven colours of white light formed when white light undergoes dispersion within the rain drops because water is denser than air, so has a large refractive index. Spray some water into the air in a direction opposite to that of the sun. Look at the water shower while you face away from the sun. You will see the colour of the spectrum of white light in the falling drops of water. The spectrum so formed hasthe shape like a bow. So it is called rainbow. This is formed when light undergoes one or single total internal reflection in the water droplets. In this type of the rainbow the violet colour is on the inside of the bow while the red colour is on the outside. The total angle of deviation (s) is the angle between the direction orf the incident ray and the emergent ray. This is the process of combining primary colours of light without loss any colour to form secondary colours of light. When all white light ( Red , Blue and Green)Combineforms WHITE LIGHT. Complementary colours of light: These are the colours which produce white light when combined. These are basic coloured pigments which form secondary coloured pigment when combined. These are coloured pigments which are formed when two primary colours combine, whichis always accompanied with the removal of other colours. Is the process of mixing two primary coloured paints ( pigments) to form secondary colour white. The colour which is common to Blue will appear while red and green disappear. The colour which is common to both red will appear while blue and green will disappear. Optical center is a geometric center of a lens. Center of curvature is the center of the sphere in which a lens is a part. 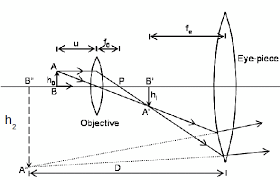 Principal axis is an imaginary line which passes through the optical center of the lens at right angle to the lens. Principle focus is a point through which all rays traveling close and parallel to the principal axis pass through. Focal length is a distance between between optical centre and the principal focus. It is important to note that the the principal focus is not the halfway between the optical centre and the centre of curvature in lenses as it is in mirrors. The plane through the principal focus which is at right angles with the principal axis is called the focal plane. An object is 2 cm high and placed 24cm from a convex lens. An image formed 72 cm. find the focal length of the lens. Rays diagrams are normally used toillustratesthe formation of images by lenses. A ray parallel to the principal axis passes through or appears to diverge from the principal focus after refraction. A ray of light passing through the principal focus of a lens is refracted parallel to the principal axis of the lens. The nature, position and size of the image formed by a lens depends on the position of the object in relation to the type of lens. For example in converging lens when the object is between the lens and principal focus the image will be formed at the same side as the object but further from the lens. It is virtual, erect, and magnified. The image by concave lens is erect, virtual and reduced. Take a convex lens. Find its approximate focal length in a way described in Activity 11. Draw five parallel straight lines, using chalk, on a long Table such that the distance between the successive lines is equal to the focal length of the lens. Place the lens on a lens stand. Place it on the central line such that the optical centre of the lens lies just over the line. The two lines on either side of the lens correspond to F and 2F of the lens respectively. Mark them with appropriate letters such as 2F1, F1, F2and 2F2, respectively. Place a burning candle, far beyond 2F1to the left. Obtain a clear sharp image on a screen on the opposite side of the lens. Note down the nature, position and relative size of the image. Repeat this Activity by placing object just behind 2F1, between F1and 2F1at F1, between F1and O. Note down and tabulate your observations. Take a concave lens. Place it on a lens stand. Place a burning candle on one side of the lens. Look through the lens from the other side and observe the image. Try to get the image on a screen, if possible. If not, observe the image directly through the lens. Note down the nature, relative size and approximate position of the image. Move the candle away from the lens. Note the change in the size of the image. What happens to the size of the image when the candle is placed too far away from the lens. The lens formula given above is general and is valid in all situations for any spherical lens. Take proper care of the signs of different quantities, while putting numerical values for solving problems relating to lenses. 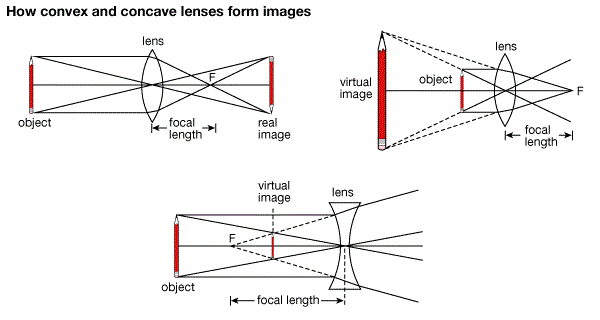 A concave lens has focal length of 15 cm. At what distance should the object from the lens be placed so that it forms an image at 10 cm from the lens? Also, find the magnification produced by the lens. A concave lens always forms a virtual, erect image on the same side of the object. or, u = - 30 cm. Thus, the object-distance is 30 cm. The positive sign shows that the image is erect and virtual. The image is one-third of the size of the object. The lens equation is given as 1/f =1/u + 1/v , if sign convection is used for u, v and f the equation applies to both converging and diverging lenses for all cases of object and image. An object is placed 12 cm from converging lens of focal length 18 cm. Find the position of the image. Since the lens is converging f = +18 cm. 1/v = 1/18 -1/12, v = -36. A magnifying glass, an ordinary double convex lens with a short focal length, is a simple microscope. The reading lens and hand lens are instruments of this type. When an object is placed nearer such a lens than its principal focus, i.e., within its focal length, an image is produced that is erect and larger than the original object. The image is also virtual; i.e., it cannot be projected on a screen as can a real image. The image formed by magnifying glass or simple microscope is virtual and erect object place between principal focus (f) and convex lens. The position of the lens is usually adjusted so that V is about 25cm, which is the shortest distance of distinct vision. Using the equation of lens (Lens formula). V = (-Ve) since the image is virtual. The above formula shows the means of obtaining the distance of object, U.
Magnification is the ratio of the image distance to the object distance. 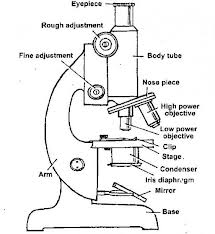 A simple microscope with lens of focal length 5cm is used to read division of a scale 0.5mm in size. How large will the division be seen through the simple microscope? Hence, each division will appear to have a size of 3.0mm viewed through the simple microscope. A compound microscope is an optical instrument used to produce much greater magnification than that produced by simple microscope. The main features of a compound microscope includes two short-focus convex lenses, the objective lens, and the eyepiece. 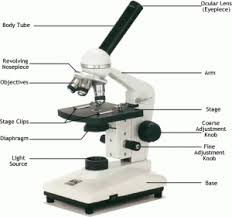 The most commonly used microscope for general purposes is the standard compound microscope. It magnifies the size of the object by a complex system of lens arrangement. 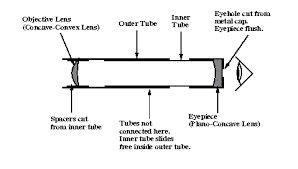 It has a series of two lenses; (i) the objective lens close to the object to be observed and (ii) the ocular lens or eyepiece, through which the image is viewed by eye. Light from a light source (mirror or electric lamp) passes through a thin transparent object. The objective lens produces a magnified ‘real image’ (first image of the object). This image is again magnified by the ocular lens (eyepiece) to obtain a magnified ‘virtual image’ (final image), which can be seen by eye through the eyepiece. As light passes directly from the source to the eye through the two lenses, the field of vision is brightly illuminated. That is why it is a bright-field microscope. The object lens forms a real and inverted image IIof the object O ( the image is slightly magnified). The eyepiece lens acts as a magnifying glass for the first image II and produces a magnifical virtual image. The object is placed just beyond the principal (fo) of the objective lens so that that the real image I, is formed inside the principal focus (F) of the eye piece. The eyepiece treats the real image I, as an object and then forms its magnified virtual image I2. Magnification of a compound microscope: This isthe ratio of the image distance produced by a compound microscope to the object distance. The magnification produced by objective lens is v/u. If the final image is formed at the least distance of distinct vision (V = 25cm). The above formula shows that the final virtual image is formed at the least distance of distinct vision. Used to magnify microorganism such as bacteria which cannot be seen by naked eyes. Used in hospitals widely to detect microorganisms in specimens provided by patients. A specimen is a small amount that is taken for testing. Blood is an example of specimens. In hospitals microscopes can detect parasites such as plasmodium ssp (a causative agent for malaria) in blood specimen. A certain microscope consists of two converging lenses of focal length 10cm and 4cm for the objective and eyepiece, respectively. The two lenses are separated by a distance of 30cm. The instrument is focused so that the final image is at infinity. Calculate the position of the object and the magnification of the objective lens. The objective lens forms a real image of the object at the principal focus of the eyepiece. The magnificent given by objective lens, Mo = 1.6. An Astronomical Telescope is used for observing heavenly bodies like stars and planets (generally bodies which are very far away from normal vision of human eyes ). Like compound microscope, it consists of two convex lenses, objective lens and the eyepiece. When the telescope is adjusted in such a way that the final image is at infinity it is said to be in normal adjustment.In this case the distance between objective lens and eyepiece is (Fb + Fe) This is the maximum separation between the objective lens and the eyepiece lens. The main reason for a distant object to be smaller is that the two objects subtend different angles at the eye. 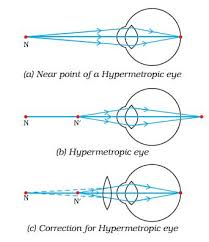 In other words, we can say that different angles substended by the eye causes a distant object to appear smaller. The object AB and CD are of the Same height.The object CD is closer to the eye than AB. The object CD appears to be taller than AB because angle B that CD subtends at the eye is greater than the angle x subtended by AB at the eye. Images there can be made to appear large by bringing them closer to the eye. In a telescope the final image is magnified because it subtends a much greater angle at the eye than does a distant object observed without a telescope. B is the angle subtended by the final image at the eye and X is the angle subtended by a distant object. 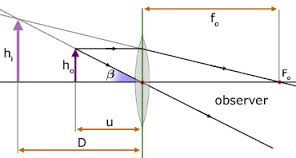 The magnification of a telescope is defined as the ratio of the angel B (in radians) subtended by the final image at the eye to the angle X subtended by a distant object at the eye. fois the focal length of two thin converging lenses of focal lengths 25cm and 4cm respectively. It is focused on the moon which subtends an angle of 0.6° at the objective lens. The final image is formed at the observers least distance of distinct vision (25cm in front of the eyepiece). Find the diameter of this image. Where X is the angle in radians subtended at the objective lens by the moon. Observation of the universe today are best made from the Hubble Telescope. Outside the Earth’s atmosphere, this telescope suffer from less interference. Telescopes see lots of colours - telescopes can collect light that our eyes are unable to: radio, microwave, infrared, ultraviolet, x-rays and gamma rays. Telescopes collect lots of light - our pupils are only a few millimeters across, so we can only collect photons over a tiny area whereas telescopes can collect photons of huge areas (e.g. a football fields worth for radio telescopes). Telescopes see fine details because of the wave nature of light and the nerves in our eyes, we can only see details about the same angular size as Jupiter's width. Telescopes can allow us to resolve fine details - like Jupiter's Great Red Spot. Telescopes can record observations with cameras - You can see things with your eye and draw them, but telescopes can share observations with the world! This is especially important for convincing skeptics that what you saw was real! The projection lantern forms images of slides or camera film onto a distant screen. The film or slide to be projected is inverted and highly illuminated. Optical arrangement of projection lantern. The slice or film to be projected is inverted and highly illuminated. The concave mirror helps to concentrate the light which would otherwise be partly wasted. The lamp is placed at the principal focus of the concave mirror. The heat filter reduces the heat at falling on the slide or film so as to avoid it overheating. Since the image of the projection lantern is Highly magnified, it would not be very bright if there was not enough illumination. The condenser directs a maximum amount of light from the source of the slide and produce uniform illumination the screen. (The condenser is a double in order to reduce chromatic aberration). The projection lens forms the image of the slide on the screen. The light source is usually located at a distance of 2f from a condenser and invited so that the image on the screen is upright (erect). The focal length of the projection lens is ABOUT TWICE THE FOCAL length of the condenser since the screen is usually far from the lens. A lantern projector using a slide of (2cm x 2cm) projects a picture (1cm x 1cm) onto a screen 12m from the projection lens. How far from the lens must the slide be? Find the approximate focal length of the projection lens. used in polarisation experiments and interference experiments. Lens camera is an instrument which produces an image of object on the screen using light. The basic physical principle of all camera is the same in spite of the variation in the design of cameras. <!--[endif]-->The lens can be moved back and forward with the help of focusing any so that objects at different distances can be brought to the focus.A forced image is locate on the film or plate when the shuttled is open for a suitable amount of time as determined by the shutter speed. 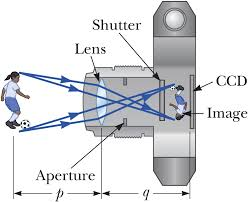 The aperture stop, which is the limiting diameter of the aperture thought which light enters the camera (given as fraction of focal length F of lens) is also called F Number. This F Number; is the fraction of focal length of the lens given as focal length divide by lens diameter. Where d = is lens diameter. This for such a lens the shutter allows light in the camera for a short interval of time. Magnification of a lens camerais obtained as the ratio of the Image distance and the object distance. A lens camera is to be used to take a picture of a man 2m tall if the lens of the camera Has a focal length of 10cm, calculate the minimum size of the film frame required, given that the man is 20.1m from the camera. Let the size of the frame be h when the height of man is 2m. The film frame should be at least 10mm square. The eyeball approximately spherical in shape.The wall of this sphere consist of two layers, the outer layer or sclera and the inner layer or choroid.The front portion of the SCLERA FORMS A TRANSPARENT CURVED section called the camera.The choroid layer is balance in order to prevent internal reflection and also to protect the light sensitive parts of the eye. The aqueous and vitreous hum our are jelly – like substance that fills the spaces within the eyeball.The aqueous humour is the salt solution of refractive index n, 1.38.Vitrous hurmour is a watery , Jelly substance of refractive index 1.34.Behind the cornea there is a colored diagram called the iris. The iris has the central hole called the pupil. The iris contains muscles which control the size of the pupil. The size of the pupil decreased in the bright light and increased in the dim light. Behind the pupil and there is a crystalline lens held in position by suspensory ligaments that are attached to the choroid layer.Near the suspensory ligaments are the ciliary muscles.The function of the suspensor ligaments there are the cilliary muscles. The function of cillary muscles is to control the thickness of the lens. The lens become thick when the ciliary muscles contract and thin when the ciliary muscles are relaxed. Image formed is inverted formed on the retina by successive refraction of light at the corner, the aqueous hurmour the crystalline lens and the Vitreous hurmour.Electrical signals are then transmitted to the Brain through the topic nerve. Finally, the brain interprets these signals. Accommodation is the process whereby the eye alters its focal length in order to form images of objects at different distances. (Thickening or Thinning of the lens causes a change in its focal length). The thickening or thinning of the crystalline lens is made possible by the action of the ciliary muscles.To view neare object t, ciliuary muscles contract, this makes the lens thicker. In the relaxed state of ciliary muscles, the crystalline lens become thinner and enables the eye to see (view) distant objects. The farthest point which can be seen clearly is called the far point of the eye and the nearest point is called the near point of the eye. This defect causes person to see near object clearly while distant objects are not seen clearly. The strength of the cornea and the eye lens combination is too great even when muscles of the eye are completely relaxed. The focal length of the cornea and the eye – lens combination is always less than the distance to the retina. Images of distant object are formed in front of the retina even when eye is totally relaxed. However, an object that is closer can be brought into focus. In this situation the focal length of the cornea and the eye lens is so short that objects closer than the conventional (near point of 25cm) can be brought into focus. That’s why this condition is called Short sightedness (near sightedness). Since the problem is that the strength of the eye – lens and the cornea combination is too great, the solution is to provide eye glasses (or contract lenses) with negative lens. The negative lens weakens the strength of the cornea and eye – lens just enough so that the resulting focal length when the eye muscles are relaxed matches the distance back to the retina so that distant images are now in focused. The eye glass lenses are negative lenses that means they are thinner in the middle than at the edges. It is easy to identify this kind of eye glass lenses since acting by themselves they do not form a real image of an object at any distance. This defect causes a person to see distant objects only and short-distance objects are not seen clearly. In the person with this condition, the strength of the cornea and the eye-lens combination is too weak when the eye muscles are totally relaxed. So the image of a distant object is formed behind the retina. The solution in the opposite of myopia. Victims should wear positive eye lenses which strengthen the corner and the eye lens just enough so that the resulting focal length when the eye is relaxed matches the distance to the back of the retina. 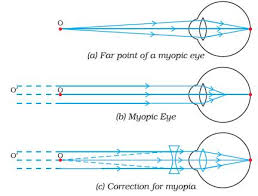 This occurs when the focal length for the cornea and the eye's lens for an object oriented in some direction is not the same as for another located in a perpendicular direction. The eye can not bring the vertical and horizontal lines in a ‘+’ symbol in sharp focus at the same time. (The axis of differing focal length need not be exactly horizontal and vertical). The problem is that the cornea of the eye lens is not symmetrical. The solution is to use eye glasses whose lenses are not symmetrical in a complementary way. The cylindrical lens may be combined with an additional positive or negative lenses. This condition typically occurs in middle-aged people. The eye muscles gradually weaken with age, so that the range or accommodation is decreased. People with this condition cannot bring both near objects and far objects into focus. The weakening of the eye muscles often causes the focal length of the eye lens to increase as well so that many people of middle age tend to become far sighted. Since the problem is adequate accommodation, no single lens can correct it and people with this problem usual needs bifocals. Bifocals are glasses with two different lens strengths, one for near and one for distant objects. The usual arrangement is that the bottom half of the lens is the near strength and the top half is the far strength. Myopia is common name for impaired vision in which a person sees near objects clearly while distant objects appear blurred. In such a defective eye, the image of a distantobject is formed in front of the retina and not at the retina itself. Consequently, a nearsighted person cannot focus clearly on an object farther away thanthe far point for the defective eye. Correction:Thisdefectcan becorrectedby using aconcave (diverging) lens. A concave lens of appropriate power or focal length is able to bring the image of the object back on the retina itself. Farsightedness, also called hypermetropia, common name for a defect in vision in which a person sees near objects with blurred vision, while distant objects appear in sharp focus. In this case, the image is formed behind the retina. the eyeball becomes too short, so that light rays from the nearby object, say at point N, cannot be brought to focus on the retina to give a distinct image. Correction:This defect can be corrected by using aconvex(converging) lensof appropriate focal length. When the object is at N’, the eye exerts its maximum power of accommodation. Eyeglasses with converginglenses supply the additional focussing power required for forming the image on the retina. 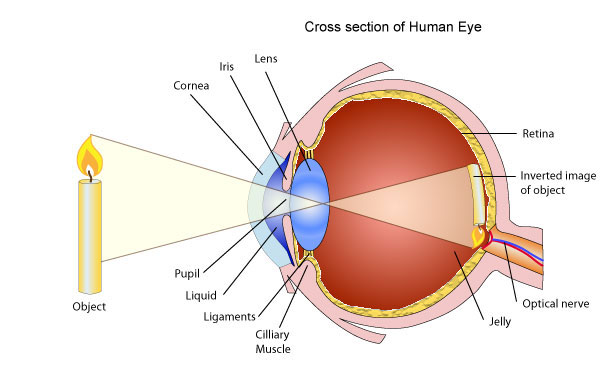 The eye and the camera has a have a convex lens which form a real and inverted image of an object. The eye and the camera are blackened inside to prevent internal reflection. Rays of light which are not received on the retina or camera film are absorbed by the choroid layer of the eye or the black surface inside the camera. The eye can regulate the amount of light that passes through the crystalline lens by using pupil while in a camera the diaphragm regulates light. In the eye the image is formed in the retina while in the camera the image is formed on the photographic plate. The eye can change the focal length of its lens by the contraction and relaxation of the ciliary muscles. In this way the eye can focus objects at different distance. 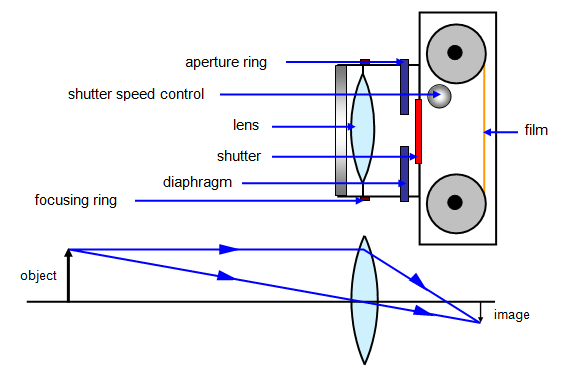 In a camera objects at different distance are focused on by moving the lens forwards and backwards.